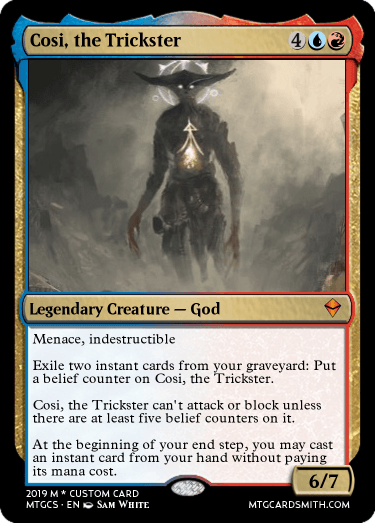 Since the first time the eldrazi titans were sealed away on Zendikar, legends and time had warped them from the monstrous devourers they were into gods worshipped by the kor and merfolk: Ula, Cosi, and Emeria. Your challenge: Turn these gods into cards. Ula: Ula is the Zendikar Merfolk deity of the realms of water. He is known as Mangeni by the Kor and is their god of the sea, blood of the world. Both deities are male. 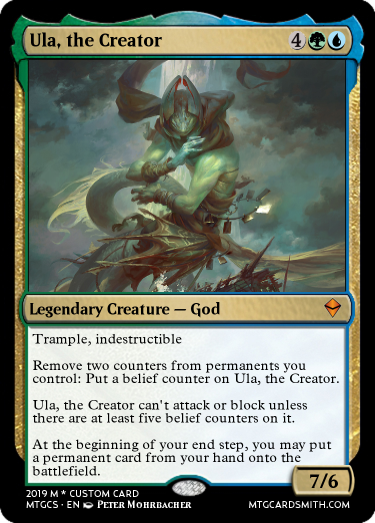 Ula was considered to be the merfolk's highest god. He was seen as dour and proud and as creator of the seas. Supplicants used to offer shells and pearl to him. Cosi: Cosi, the trickster god, is the Zendikar Merfolk deity of the realms of land and earth. He is known as Talib by the Kor and is their god of the earth, the body of the world. Both deities are male. Regular merfolk never layed offerings at the feet Cosi's statues, calling him the forbidden god. However, he was worshiped in secret by children and the elusive Tricksters who were willing to break normal rules for the benefit of the tribe. 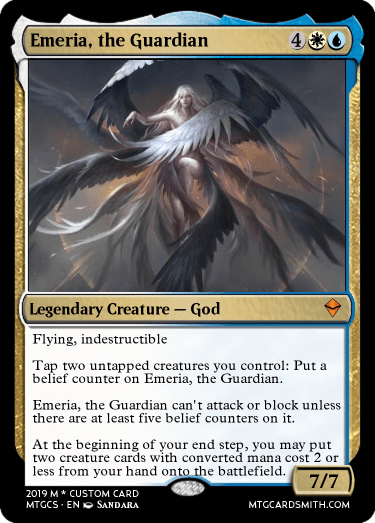 Emeria: Em or Emeria is the Merfolk deity of the realms of the sky, wind, and clouds on Zendikar. She is known as Kamsa by the Kor and is their goddess of the wind, the breath of the world. Both deities are female. Emeria was conceptualized as a great angelic being, an impartial refuge in a dangerous world — her halo a sign of hope. Merfolk believe that the floating hedrons and buildings that make up Emeria, the Sky Ruin were once the home of the Goddess. Supplicants used to offer hedron shards and land-fruit to her. Standard forum and cardsmithing appropriateness rules apply. Due date is January 31st 23:59 MST. Entrants can enter one card for each god. There will be three winners, one for each god. Winners will receive a favorite on their winning entry and two cards of their choice. A person cannot win more than once. I'm looking for creativity, as opposed to the standard Theros/Amonkhet style of god. A bump to bump when bumping is to be bumped. Here's more details about both the Kor and the Merfolk, as both have different names for them.